The designated animal for the State of Florida, the Florida panther was a sickly, scrawny, almost extinct animal just a few short decades ago. Feared and hunted almost to extinction, to protect the remaining few and give them room to roam, a wildlife refuge was established. As a large predator each panther requires at least 100 square miles of territory to roam so it can find a reliable and adequate food source. 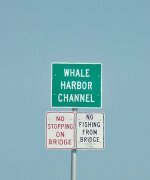 This designated wildlife refuge is just north of the Everglades National Park, with a portion of it's territory reaching into the northwest region of the Everglades. Why Are Florida Panthers Endangered? The major cause behind the decline and almost extinction of the panther in Florida, was their geographical isolation. There are no other cougars east of the Mississippi River to breed with. Due to this fact, they became severely inbred and this resulted in disease and ongoing poor health. This inbreeding, combined with lack of space resulted in a reduced food supply. Factor in man's innate fear and subsequent hunting down of these cougars, and you have the recipe for not just extermination but extinction. At one point, in the 1970's it was believed that there were no pumas left in the State of Florida at all. Roy McBride, a cat tracker was brought in to determine whether the species was finally extinct. What he found was shocking - one solitary and diseased female. This discovery brought an increased interest and awareness to the plight of this Florida lion and a search for others began in earnest. 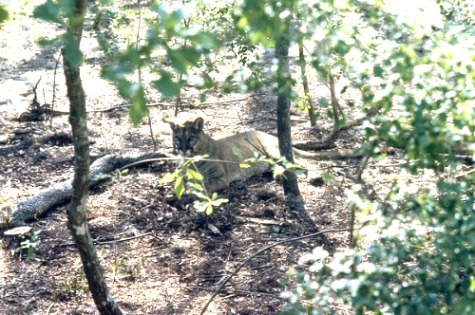 One of the most controversial steps taken to help increase their numbers was the introduction of several Texas cougars. These cougars were determined to be genetically similar to the ones living in Florida, with the exception that they weren't inbred, and so were healthier. The end result was that the endangered Florida panther was able to make a small comeback, and the animals found in the region today are stronger and healthier. There are however some marked physical differences between the two breeds of cat, including their new hybrid offspring. 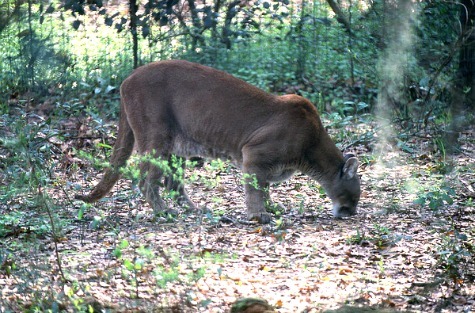 The Florida panther typically has longer leaner legs, with smaller paws. It's head is longer and flatter, with wider nostrils and it's coat is redder and coarser. The "new" version tends to resemble the standard mountain lion. They're wilder, stronger, healthier, and have more compact, muscular bodies. You can get more information about this endangered species from the following fact oriented books. You can also see from the other previews below, that this State 'representative' is a popular choice for display on t-shirts and posters. For the 'cat' enthusiast, or anyone concerned about endangered species, these items provide further information and help to create a greater awareness of this animal and it's plight. Lions living in this region now face a new and dangerous threat. The python has taken a strong foothold in the Everglades National Park and has begun to move outside the boundaries of the Park into neighboring regions. Python have been found in the Big Cypress Swamp area which is where part of the puma's Wildlife Refuge is located. These large reptiles have been credited with killing and consuming panther and this new threat adds to their tenuous plight. 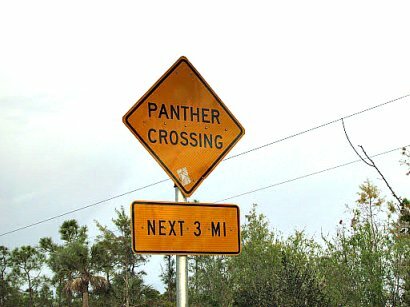 Another ongoing danger to the Florida panther is traffic. There is only a very small established population, and unfortunately each year an important percentage of these large cats are killed by cars on the highway. These accidents typically occur at night when these nocturnal animals are hunting and visibility is at it's poorest for the driver. Even though crossing signs are posted at frequent intervals to alert motorists to the fact that they're traveling in puma country, the deaths still occur. These incidents can ill be afforded, considering the small numbers of cats still alive in the region. Even though they have the Florida Panther National Wildlife Refuge as a safe haven, their increasing numbers push them outside the boundaries of their sanctuary to hunt and live. As the human population grows, and developments continue, more natural land disappears. This constriction of space crowds the large cats, making it increasingly difficult for them to find food. This in turn forces them to come closer in to where man lives. The end result is that they are forced to prey on livestock, pets and possibly humans. Children and women are at greatest risk because of their smaller stature, plus children naturally run and play. This movement stimulates a lion's natural response to pounce and attack. In fact, the lion's urge to attack a moving target is so strong, that each year men and women are killed in the United States while jogging. The Florida Panther games we're playing a very high stake indeed. Their very survival depends on the outcome. One of the greater challenges they face is man's natural fear of them. This has been responsible for bringing them to the edge of extinction on more than one occasion. Now that their numbers have grown to under 100, they're beginning to interact with us more frequently again. This interaction unfortunately has negative results as man's assets, namely livestock, pets and family can be at risk. The question that remains is "How much interaction are we willing to take before we've had enough again?" The big cats need their space, and they need food to survive. In Florida there is very little of either. We are their worst enemy as we continue to build up the areas they live in, pushing them into even tighter quarters. Yes, we want them to survive, but are we willing to give up certain rights for theirs? We all want the Florida panther to be more than just a tawny spot on a page of history, yet we resent their natural instincts to survive. Big cats hunt and kill - that's a fact. Will it ever be possible for us to have a happy, peaceful co-existence with them? Are they slated to be extinguished forever? Or worse, will these majestic animals be banished to some commercial pet farm or zoo? The final telling of this tale is yet unwritten, and no doubt there will be considerable backlash no matter the outcome.